Neil Gaiman is one of my favourite authors. His stories are cleverly woven with intricate details and disturbing thoughts. I loved Coraline and The Graveyard Book. 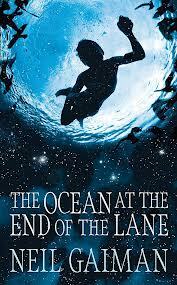 The Ocean at the End of the Lane was in the same league. I know this phrase is overused in the reading world but this book was difficult to put down. It was quite a simple story yet its impact was immense. A child’s worst nightmare is to be taken by unknown creatures in the night. For the boy in this book nightmares become reality.